Forty years after the late Gwynfor Evans became the first Plaid Cymru MP, a memorial has been unveiled to him. He was elected Carmarthen MP on 14 July, 1966, in a historic by-election. The Cofio '66 (Remember '66) rally marking the anniversary was at the village of Bethlehem, near Llandeilo. "Wales and Carmarthenshire would not be the country and county they are today had it not been for Gwynfor's contribution," said the area's current Plaid MP, Adam Price. 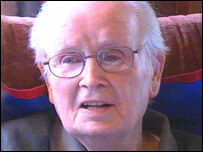 Gwynfor Evans, who died in April 2005 at the age of 92, was one of Wales' leading political figures of the 20th Century. He put Plaid Cymru firmly on the UK's political map when he unexpectedly won Carmarthen in the by-election caused by the death of Labour MP Dame Megan Lloyd George, the daughter of former Prime Minister David Lloyd George. Fourteen years later he threatened to starve himself to death in the cause of Welsh language television, leading to the foundation of S4C. On Saturday a permanent memorial stone was erected to the late politician on the Garn Goch. He would often climb seeking inspiration when the family lived between Bethlehem and Llangadog and he requested his family to scatter his ashes at the site. 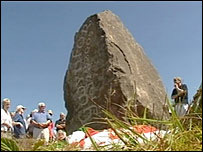 The memorial stone, weighing 7.5 tons, was quarried in Llandybie and his name was carved on it by Ieuan Rees, who has been responsible for a number of memorials to historic Welsh figures. Meleri Mair, for Dr Evans' family, said the monument was a "very striking and a worthy tribute". "The family is especially pleased that Ieuan Rees undertook the work of preparing the stone, as he's one of the experts in his field and we greatly admire his work." She also thanked the company T Richard Jones, of Betws, who carried the stone from the workshop to Garn Coch and the landowner for their co-operation. Prominent Plaid Cymru figures, including president Dafydd Iwan and the former party leader Dafydd Wigley will speak at the rally, along with Reverend Guto Prys ap Gwynfor, one of Dr Evans's seven children. Carmarthen East and Dinefwr MP Adam Price said: "Gwynfor's contribution to Welsh life cannot be underestimated. "Gwynfor's victory in 1966 was a huge political milestone and it is an honour for me to be able to speak at the unveiling of his memorial."